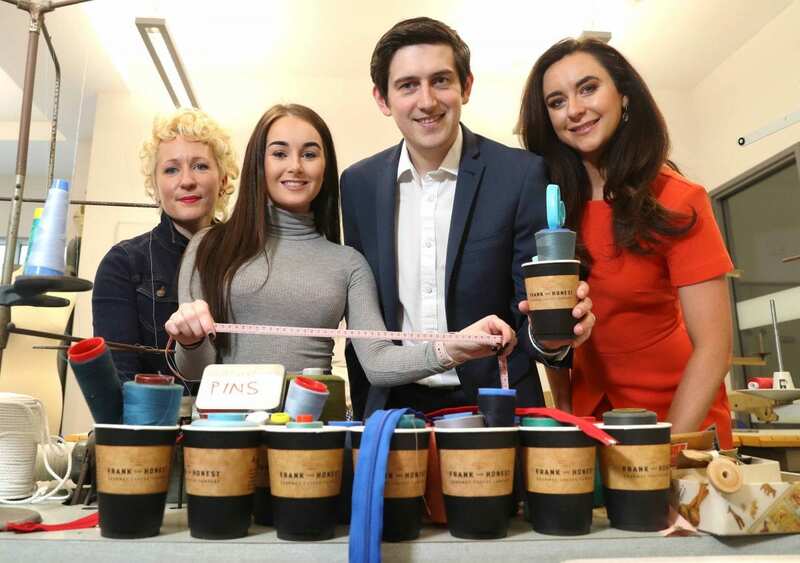 Frank and Honest, who recently announced their commitment to become the first national coffee brand to move to 100% compostable coffee cups, has joined forces with the Ulster University to launch a competition asking their fashion students to create a wearable garment using only Frank and Honest compostable cups in their design. The students will create detailed drawings of wearable fashion designs from which the judges, from the Ulster University and Frank and Honest, will choose the winner who will get a cash prize, the chance to make their creation and to have it exhibited at a special event. Find out the handiest place for you to get some Frank and Honest goodness at www.frankandhonest.ie. Frank and Honest just announced their commitment to become the first national coffee brand to move to 100% compostable coffee cups and to celebrate Fergal O’Kane (second right) from Frank and Honest, (l to r) Rachael Dickson, Associate Head of Ulster University’s Belfast School of Art, Caoimhe Scullion, textile, art, design and fashion student at Ulster University’s Belfast School of Art and former Miss Earth, Amira Graham have launched a competition asking textile, art, design and fashion students at Ulster University to create a wearable garment using only Frank and Honest compostable cups. Fergal said: ‘We are so thrilled to be partnering with the University of Ulster and their incredible students. We’ve made a commitment to using only compostable cups by September this year and we wanted to celebrate this by working with the designers and recyclers of the future who will help us to communicate the importance of sustainability in a really fun and visual way.’ The winner will get £1,000 and get the chance to make their design which will be exhibited at a special event later this year. Find out the handiest place for you to get some Frank and Honest goodness at www.frankandhonest.ie.